‘Morgen Vielleicht!‘ (Maybe Tomorrow!) by Franz Lehar, published by Gabor Steiner Verlag (Wien, 1923) and illustrated by Ferenchich. ‘Gabor Steiner! I like this man. How grateful all Wiener should be to him! He alone saves Vienna’s reputation as a theatre town, as the city of music, dance and joy of life’. 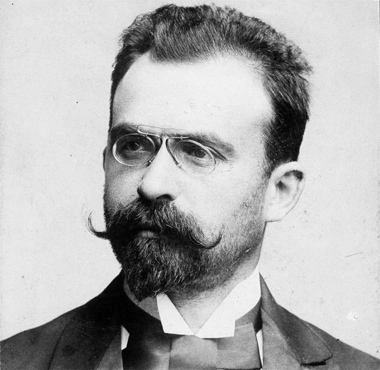 Gabor Steiner (1858-1944), the publisher of ‘Morgen Vielleicht!’ (Maybe Tomorrow!) was born with entertainment in his veins. Since early childhood he was spiritually nourished by artists and composers. His father was a famous Viennese theatre manager. His son’s godfather was the leading Austrian composer Richard Strauss. Amongst the friends of the family were Jacques Offenbach and Johann Strauss, Jr. Well, that is to say, until Johann Strauss’ second wife —thirty years his junior— left her middle-aged husband for Gabor’s brother. ‘Wenn ich mir nur Fanny abgewöhnen könnt…!’ (If I could just stop yearning for Fanny!) 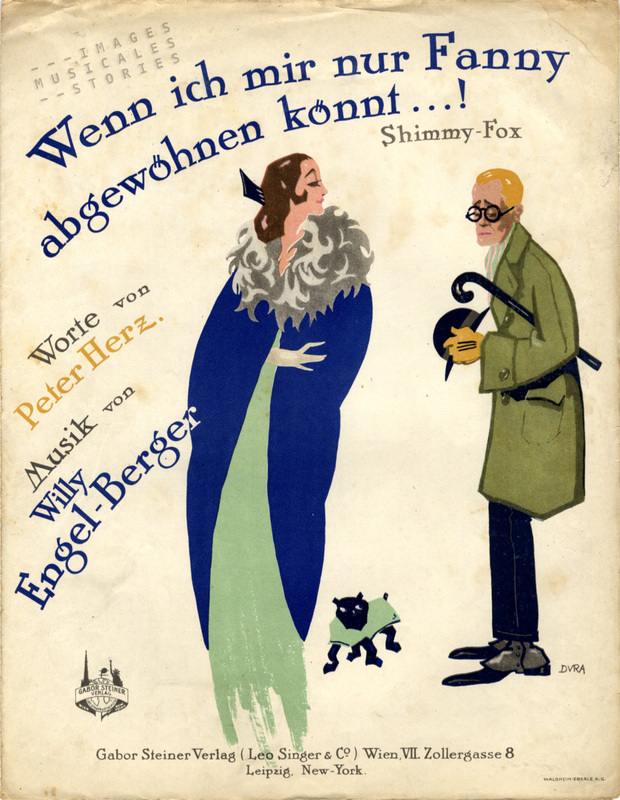 by Willy Engel-Berger & Peter Herz, published by Gabor Steiner Verlag (Wien, 1923) and illustrated by Dura. Gabor was a busy bee, always on the lookout for new ways to entertain people. He started working in theatres in Germany before ending back up in Vienna where he founded a concert and theatre agency In 1887. Two years later he began a publishing house to bring out plays and a theatre newspaper. But in 1890 Gabor Steiner had to stop all these enterprises because they proved not profitable. 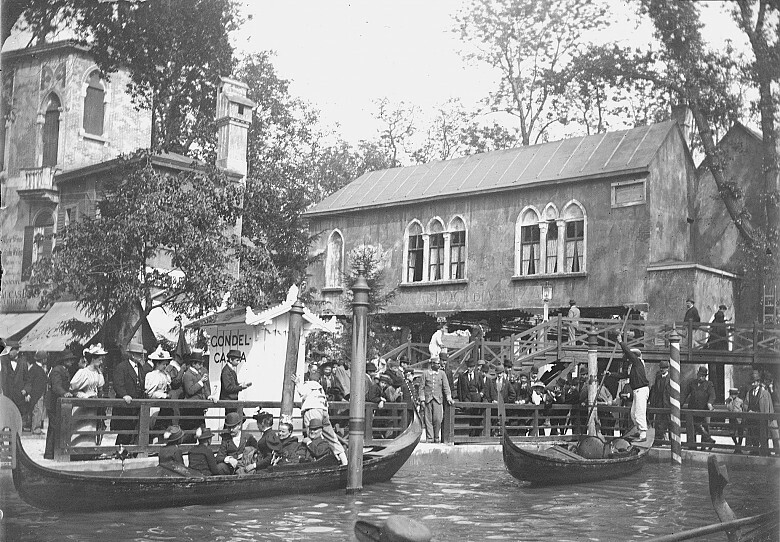 During a visit to London Gabor witnessed Venice in London, a unique and dazzling spectacle. 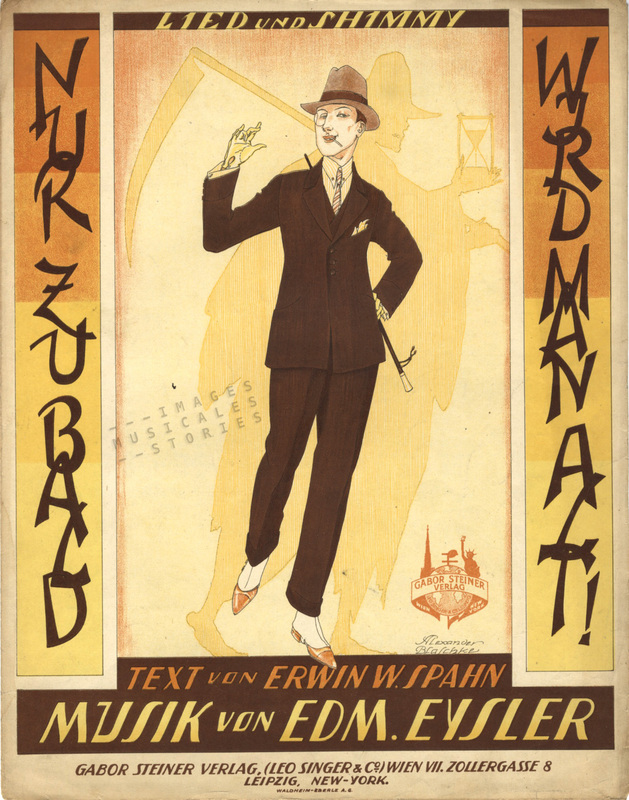 It was produced by Imre Kiralfy and staged at the Olympia Theatre. 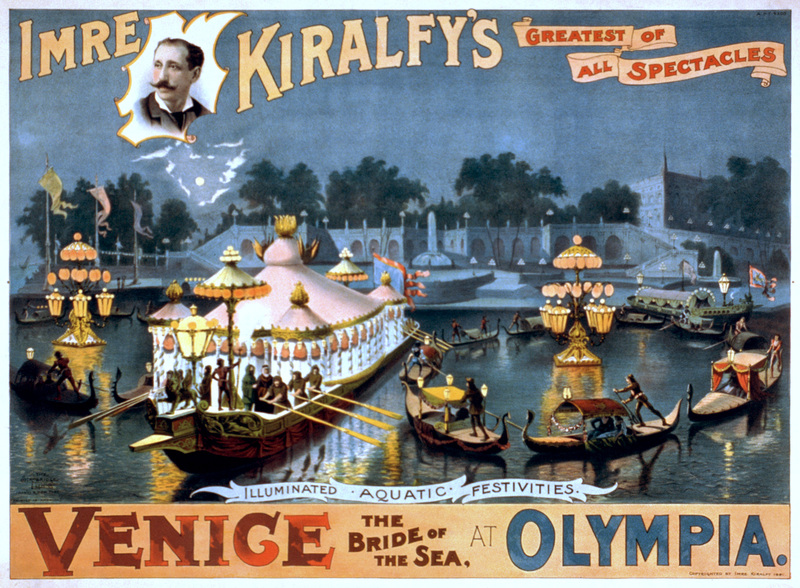 Kiralfy replicated the bridges and canals of Venice using machinery, water and electricity. On the gigantic stage no less than 1,400 persons were busy creating an enchanting illusion. Inspired by this splendour Gabor leased part of the Wiener Prater, to build his own theatre and entertainment city: Venedig im Wien, which opened in 1895. This Viennese version was an ‘artful’ imitation of Venetian buildings and gondolas with navigable channels constructed on an area of the Prater park, roughly half the size of a soccer field. More than 2,000 employees were catering for the visitors. There were shops, restaurants, cafes, a champagne pavilion, a wine tavern and a beer garden. Various stages offered a variety of concerts, Viennese farces, French comedies, operettas, revues, ballets, cabaret and wrestling events. Woo-hoo! 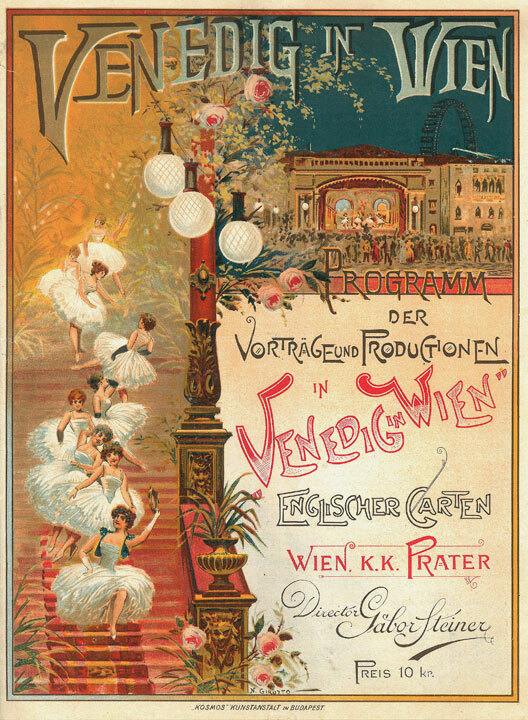 Venedig im Wien became a huge triumph and the extravaganza attracted crowds of people of all classes. The complete Who’s Who of the Viennese operetta performed there for many years. The success of his theme park didn’t stop Gabor Steiner from following his business impulses. On the contrary, after the Lumières had held their first private screening of projected motion pictures in 1895, he bought their only other available cinématographe and opened the first cinema in Vienna. Unfortunately, the device was very poor. The viewers complained of headaches because of the strong flicker. At times the device failed completely and the public had to be refunded. Gabor Steiner didn’t wait the end of the season to close his cinema. 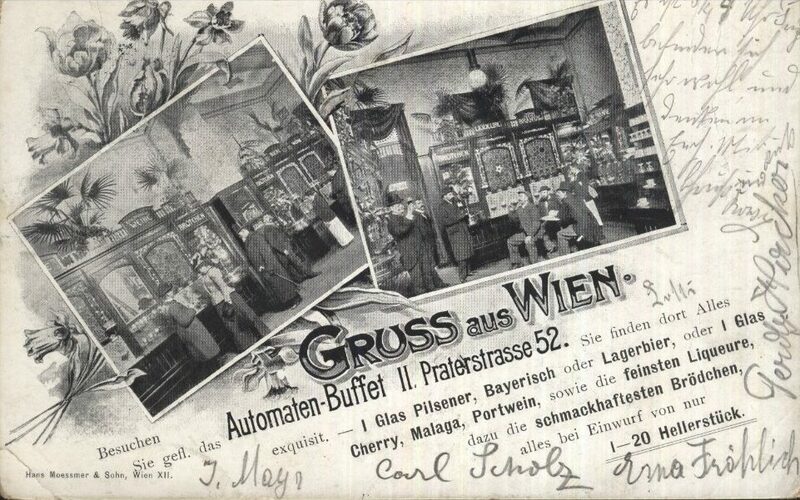 Around the same time Gabor envisioned another commercial opportunity when in 1895 the first buffet vending machines were built. Needless to say Gabor also had to acquire such an Automaten-Buffet which he imported from Naples. The novelty allowed customers to obtain beverages and sandwiches by inserting coins into the rather monumental machine chests. These entrepreneurial excursions didn’t make Gabor lose sight of his golden goose in the Prater park. For fear that the visitors would lose interest, every year Gabor Steiner frantically renewed, expanded or completely remodelled the Venedig theme park. In 1897 he instigated the construction of the iconic giant Riesenrad that you’ve seen in the film The Third Man. Or didn’t you? 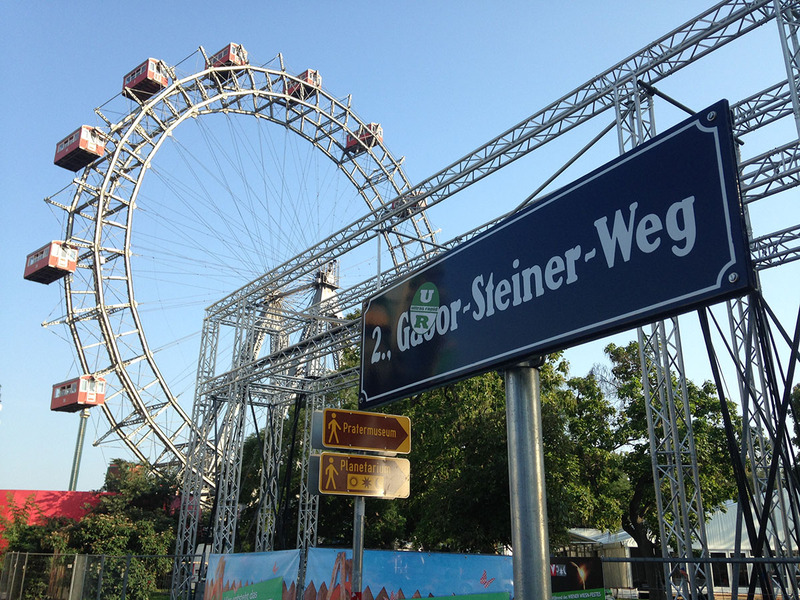 It was near this Ferris wheel that in 1987 a lane in the Prater was named in honour of Gabor Steiner. 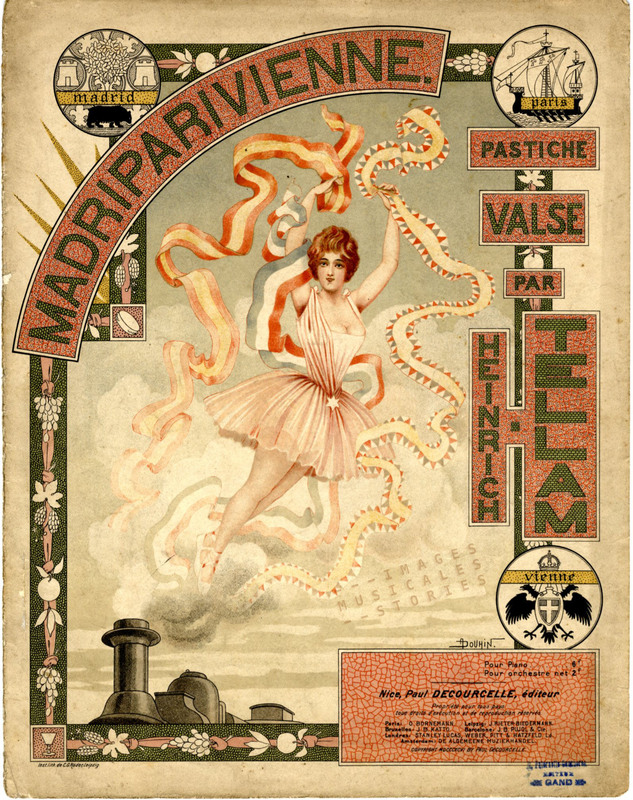 The wheel inspired the fox-trot song Das Lied vom Riesenrad, for which Marcel Vertès —like Gabor Steiner a Hungarian— designed the twirling sheet music cover. The Gabor Steiner lane in the Prater in Vienna (photo ImagesMusicales, 2014). 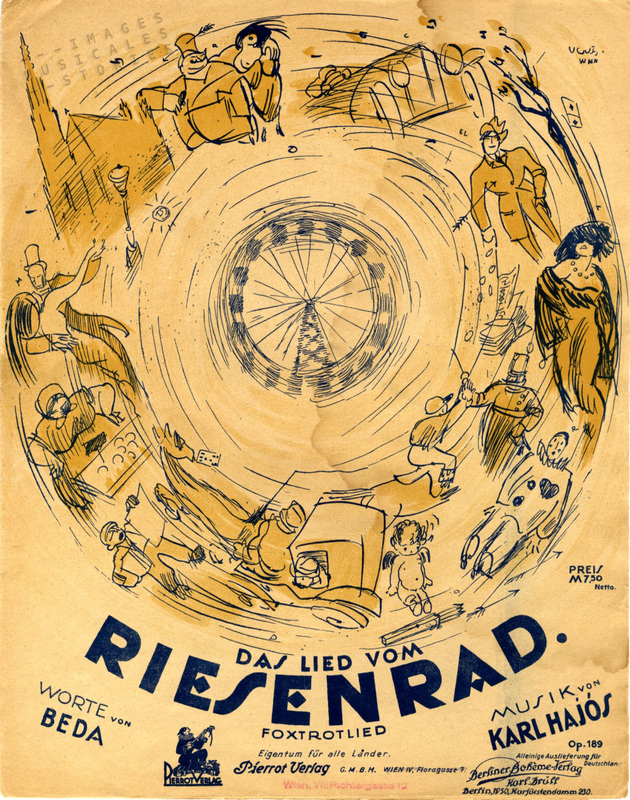 ‘Das Lied vom Riesenrad‘ (The Song of the Ferris Wheel) by Karl Hajos & Beda, published by Pierrot Verlag (Wien, 1921) and illustrated by Vertès. In his constant quest to improve the entertainment park, Gabor filled up a ‘Venetian laguna’ in order to build an open-air theatre for 4,000 spectators. There he treated his public to typical ‘Prater-operettas’ presenting up to 200 dancers in huge ballet scenes. Later still, in 1901 Steiner demolished the Venetian buildings altogether. In its place he established a new International City, the year after he created a Flower City and in 1903 it became the Electric City. 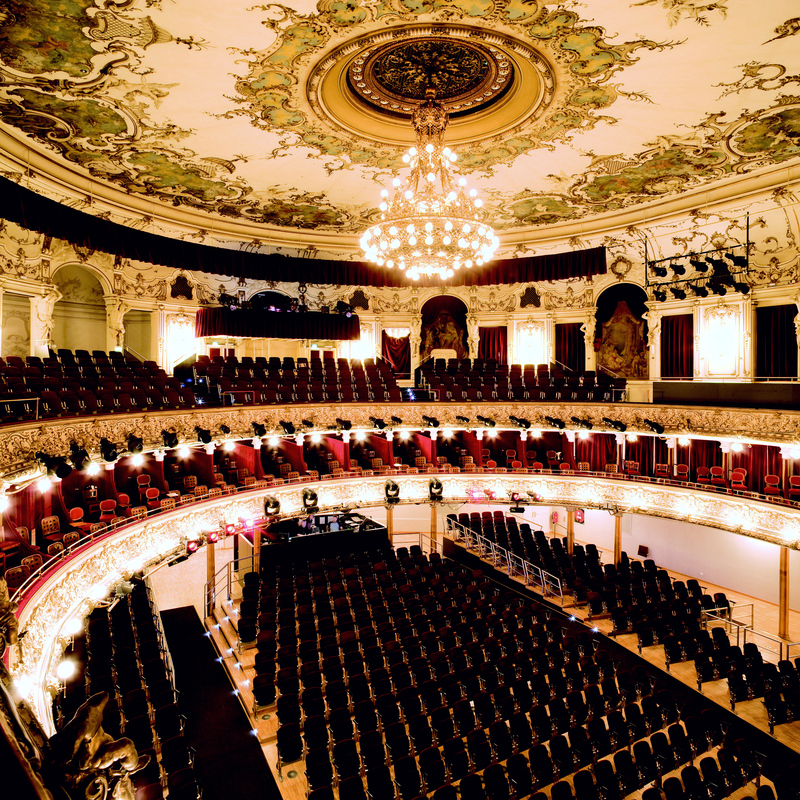 Meanwhile in 1900 Gabor Steiner had acquired the Danzers Orpheum, a theatre in the centre of Vienna. He completely redecorated the place in glitzy neo-Baroque style. The theatre was used as a winter venue (when the park closed) for the Venedig im Wien spectacles. The grand opening was with the operetta Venus auf Erden (Venus on Earth) from Paul Lincke, father of the Berlin operetta. 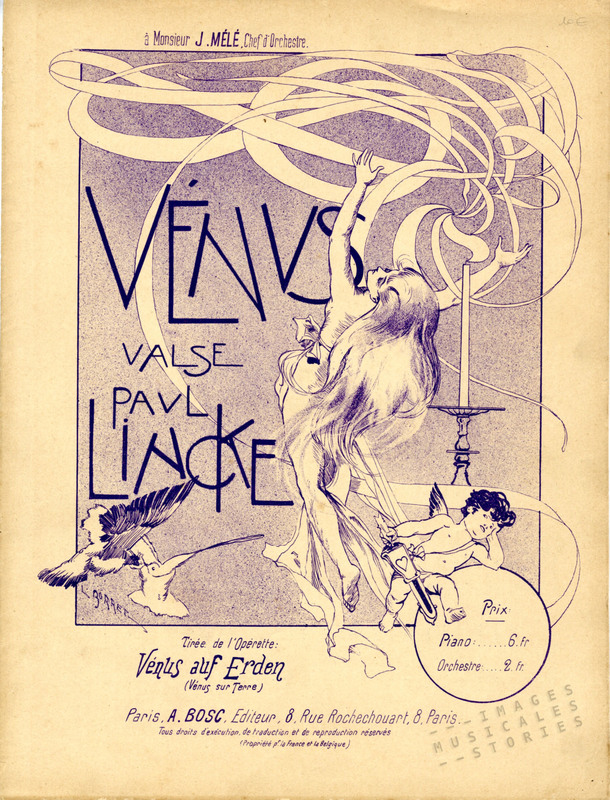 ‘Venus auf Erden‘ (Venus on Earth) by Paul Lincke, published By A. Bosc (Paris, s.d.) and illustrated by Leonce Burret. In 1908 Steiner got into financial difficulties and went bankrupt. For a few years he then tried his luck in managing the Viennese Ronacher theatre. But megalomaniac habits die hard and in 1911, the enormous cost of the theatre’s lavish refurbishing brought him into financial troubles again. Interior view of the Ronacher theater (source Wikimedia Commons, photo Paul Ott / VBW). It is now time to focus on Max, the son of Gabor Steiner. Max was a child prodigy, conducting operettas when he was only twelve and composing his first operetta aged fifteen. 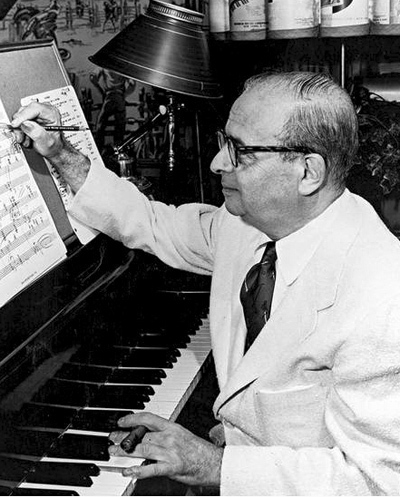 He would later become known in Hollywood as the father of film music writing the scores for more than 300 films. To mention just a few: Casablanca, King Kong, The Caine Mutiny and Gone with the Wind. The first time his father went bankrupt, Max moved to live and work in London. But in 1911, when Gabor again run into trouble, he returned to Vienna to help. He took over his father’s theatre and tried to stem the losses, but to no avail. The Ronacher was closed. Max was even imprisoned for a short period. His father had pre-sold a whole-year advertisement in the Ronacher theatre program. As managing director Max was sued for breach of contract. At the end of that same year 1911 Gabor regained the management of his former amusement Park in the Prater. There he opened an exhibit called the Lilliputstadt (midget city) together with his sister’s son, Leo Singer who had assembled a troupe of performing little people. Lamentably, in the shortest of times, Gabor accumulated more debts and went bankrupt once more. In 1913 he separated from his wife and fled Vienna and his financial problems and he lived for eight years in London, Switzerland and New York. 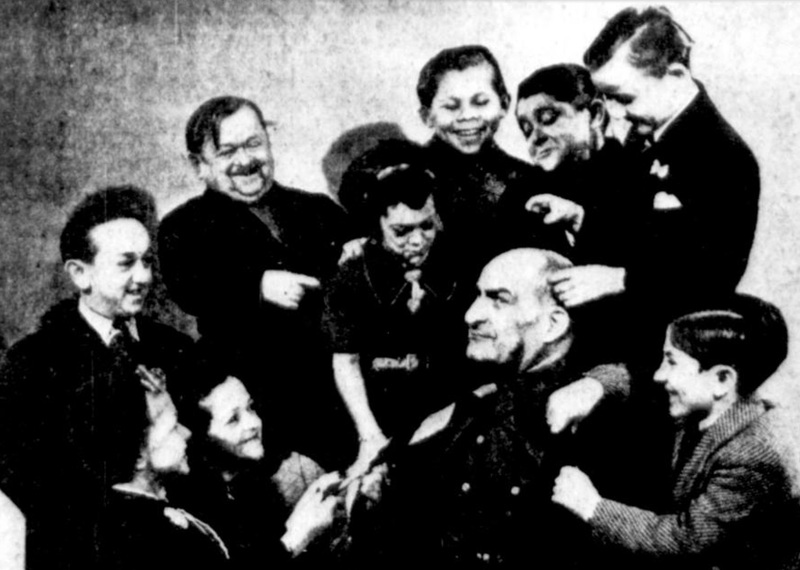 Picture of Leo SInger, surrounded by little people, in the Milwaukee journal, 14 December 1940. Abroad, Gabor probably met again with his nephew Leo Singer, who had moved to the United States at the outbreak of the First World War. Years later, in 1938, Singer would provide 124 little people for the Munchkins in The Wizard of Oz. 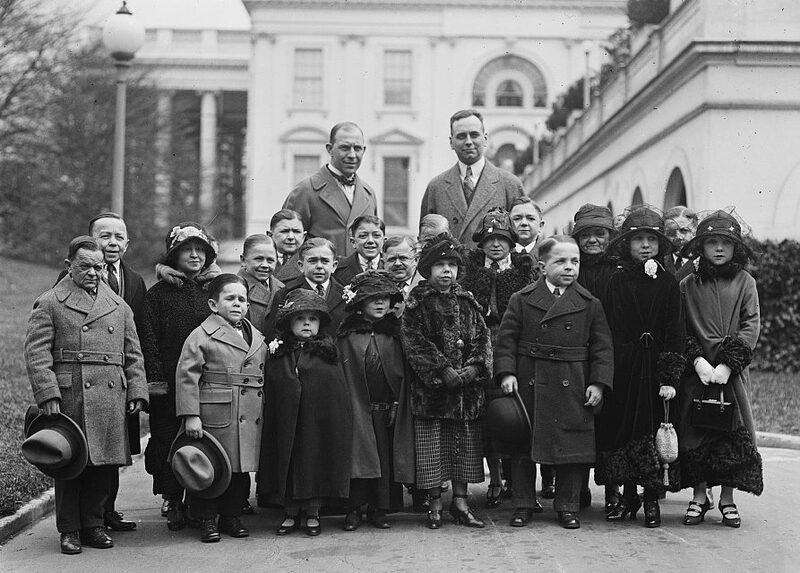 The company of the tiny men and women who compose the famous Singer Midgets were received by President Coolidge in the White House. Library of Congress Prints and Photographs Division Washington, D.C. In 1921, after his voluntary exile, Gabor Steiner returned to Vienna. He was now sixty-three and hoped to become a theatre director once more. But it didn’t work out. Instead he started a music publishing house, the Gabor Steiner Verlag, together with Leo Singer who held office in New York and with the financial help of his son Max. From what we can deduce the publishing venture didn’t last long: the only known sheet music is copyrighted 1923 and early 1924. So far for Gabor’s triumphant comeback! * Only to soon you will be old! ‘Nur zu Bald wird man Alt!‘ (Only to soon you will be old! ), by Edmund Eysler & Erwin Spahn, published by Gabor Steiner Verlag in 1923 and illustrated by Alexander Blaschke. ‘Izak Meyer’s Wiegelied’ by James Cohen van Elburg, published by Ph. Hakkert (Rotterdam, s.d.) and illustrated by Hardy. 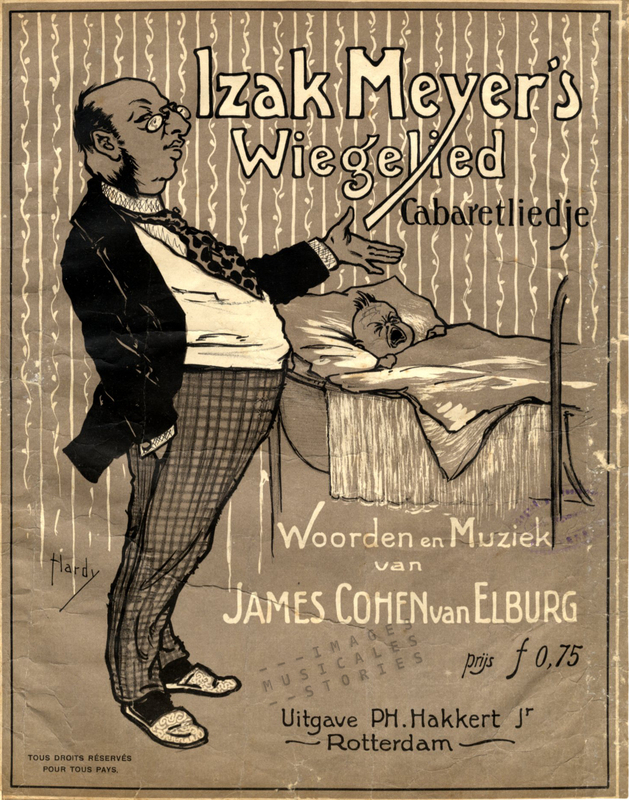 Izak Meyer’s Wiegelied is an endearing Jewish lullaby sung by an orange seller to his newborn son hoping he will do better in life than himself. 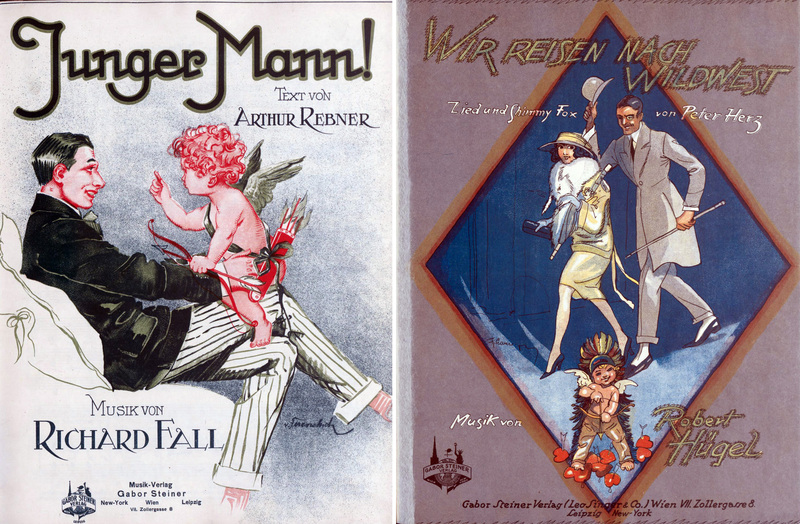 The cover illustration by Hardy might suggest that the song is a racist Jewish stereotype. However, it was composed by James Cohen van Elburg and published by Philip Hakkert1. Both were Jewish and with the song’s comical-sounding Yiddish words they were probably mocking themselves. We still can enjoy it, sung by Max Tailleur in his typical thick Yiddish accent. 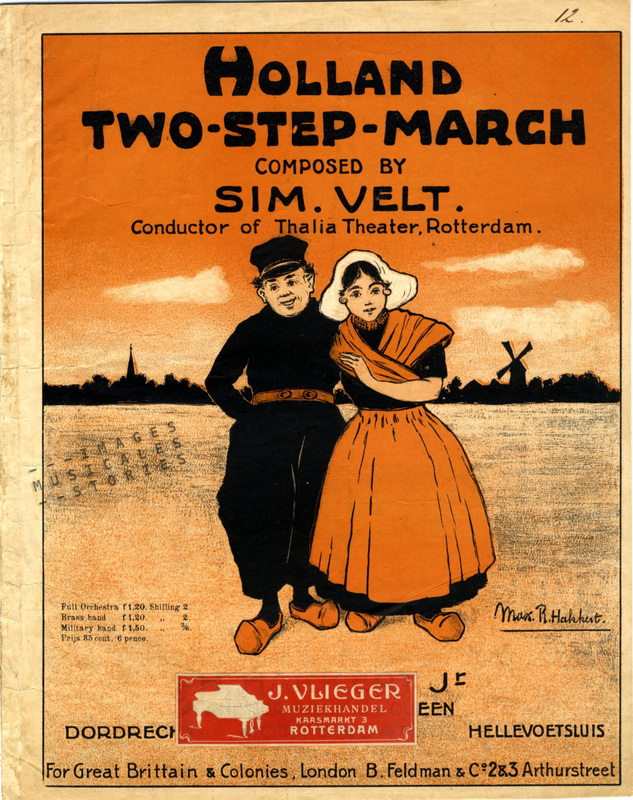 In 1880 Philip Hakkert (1859-1925), an avid amateur musician and conductor, founded a music business in Rotterdam. Initially his shop sold musical instruments and sheet music, later phonographs, music automata and records too. In 1914 Hakkert also began the production of catgut, a strong cord made of the intestines of animals, especially sheep. It was used for string instruments, tennis racquets, and surgical material. Opnames gemaakt in 1940 bij de Eerste Nederlandsche Snaren- en Catgutfabriek Hakkert in Rotterdam. Het bedrijf was gevestigd aan de Vlaggemanstraat 25 en is in 1917 opgericht door vioolbouwer Jacques W. Hakkert en heeft tot in de zeventiger jaren van de vorige eeuw snaren geproduceerd, van hoogwaardige viool- en cellosnaren tot bespanning voor tennisrackets en aandrijfsnaren voor machines. Maar de grootste hoeveelheid "catgut" (schapendarm) werd gebruikt om hechtdraad voor operaties te fabriceren. Een unieke opname van een uniek bedrijf! 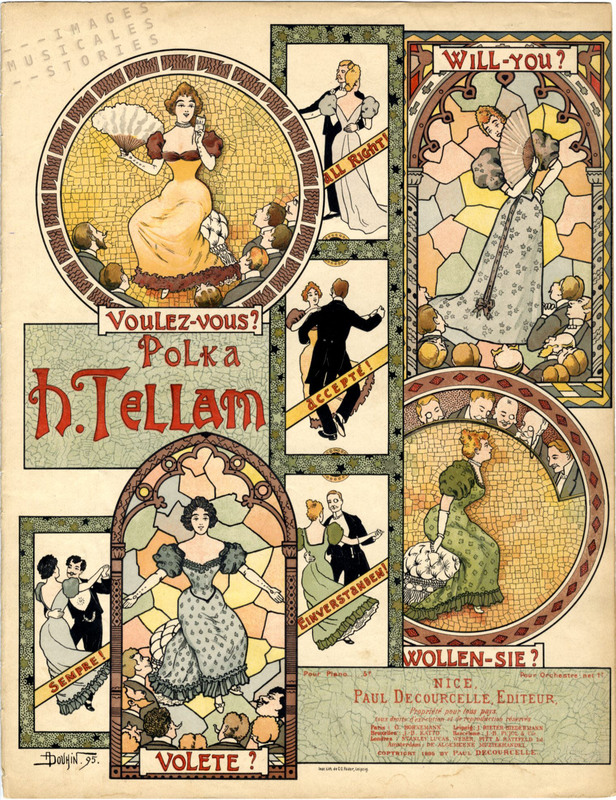 Around 1916 Philip Hakkert started to publish his own sheet music. Some in our collection are ingeniously illustrated by a young illustrator and poster designer, Carel (‘Carlo’) Jung from Rotterdam. 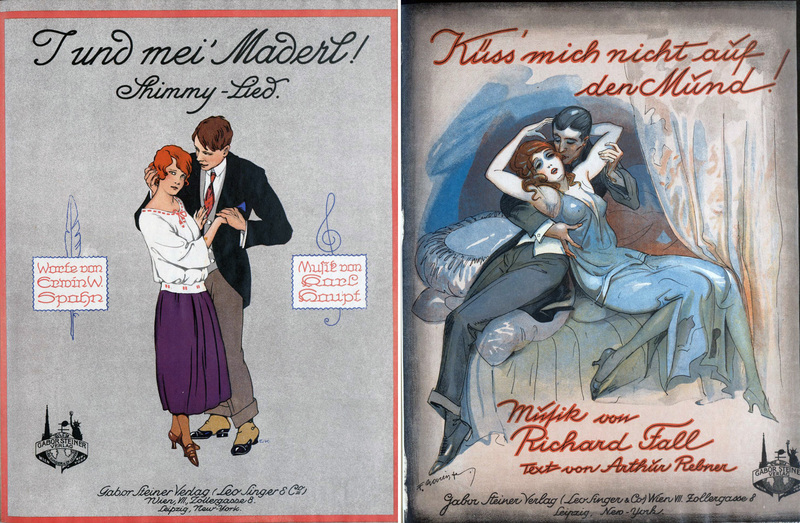 Hakkert’s sheet music illustrated by Carlo Jung (1917-1919). Philip Hakkert’s two sons, Jacques Wolfgang (born in 1891) and Mozes (Max) Richard (born in 1894) helped in the business. Their second names reflect the musical interests of their father: Wolfgang Amadeus Mozart and, ironically, Richard Wagner. Jacques specialised in making violins and cello’s. His brother Max on the other hand, played among others a prominent role in the pre-war cabaret and jazz scene. He liked to go dancing in the Pschorr, an enormous dance hall with a sensationally illuminated glass dance floor, an impressive glass ceiling, and gigs by famous orchestra’s. Pschorr was the place to be (…seen) in Rotterdam. 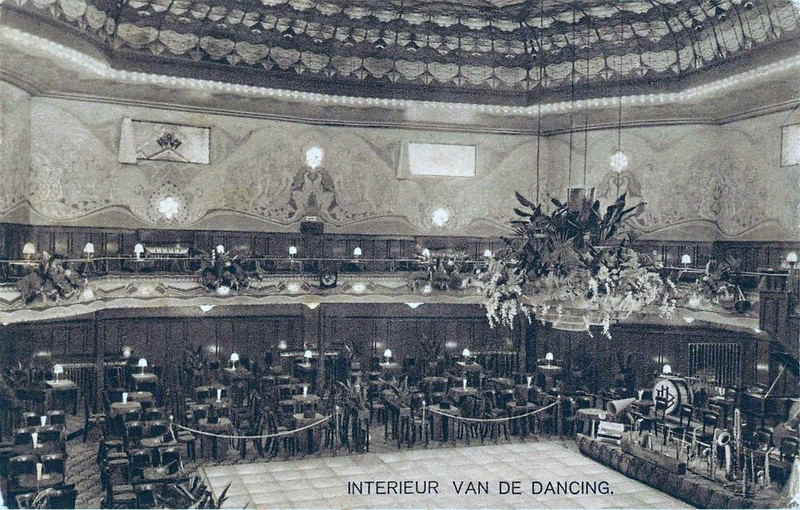 Interior of Pschorr, a dance hall in Rotterdam. There Max Hakkert could make contacts and prepare deals with showbiz people and musicians, including Coleman Hawkins and Louis Armstrong for whom he arranged concerts in The Netherlands. ‘Louisette’ by Sim. Velt, published by Ph. Hakkert (Rotterdam, s.d. ), illustrator unknown. 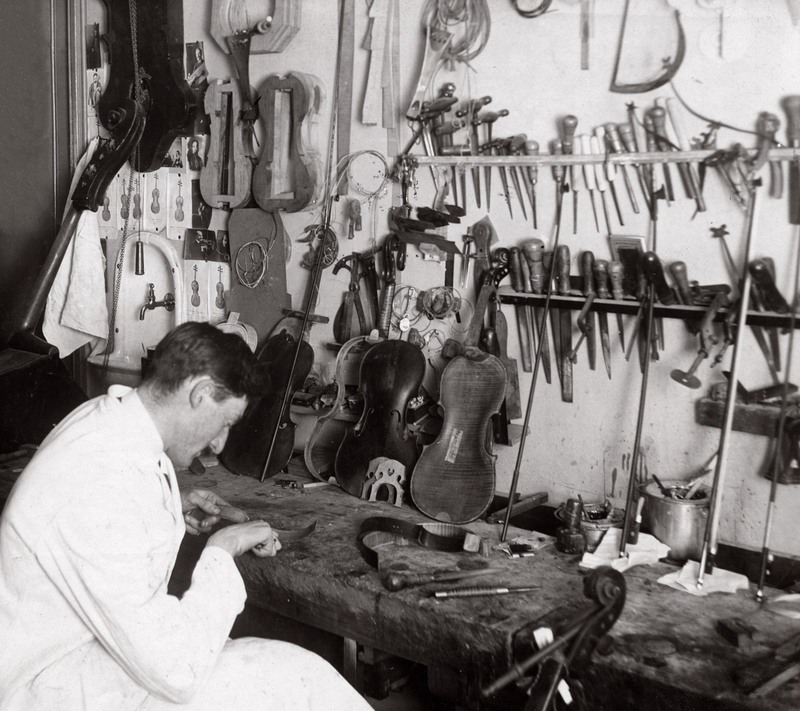 After Philip’s death in 1925, Jacques continued the violin workplace and the catgut manufacture while Max took on the music shop and the wind instruments workplace. Left: Mozes Richard (Max) Hakkert in 1940. Middle: Flora Hakkert-Sanders. (photos by courtesy of Albert Rottier, source: joods erfgoed rotterdam) Right: Ans and Flip Hakkert, ca. 1925 (Jewish Historical Museum, Amsterdam). Max had married Flora Sanders, a piano teacher in 1916. They had met in his shop which Flora regularly visited to buy sheet music. Together they got two children, Anna (Ans) was born in 1918 and Philip (Flip) in 1920. Max adored his family. 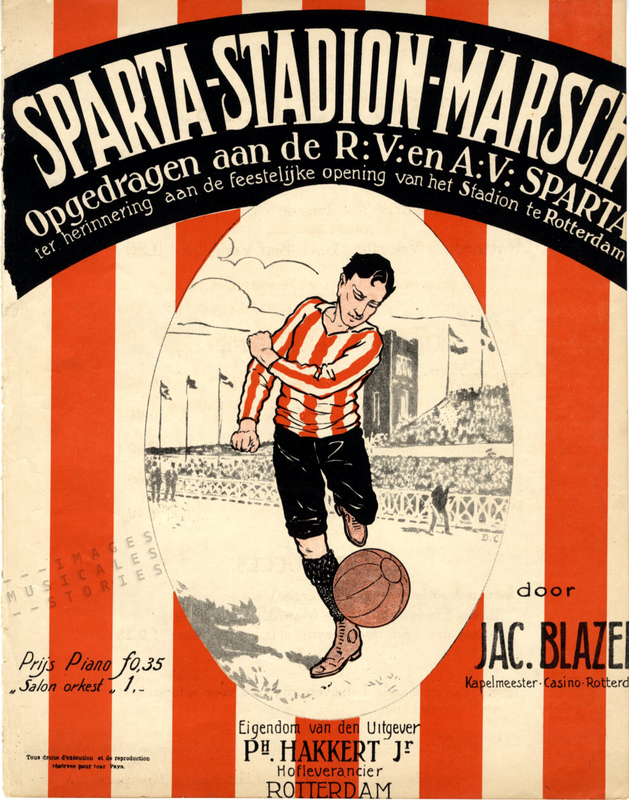 He was a football fan and a keen supporter of Sparta Rotterdam, still an elite sports club at that time. He also enjoyed his business trips to London in a small Fokker aeroplane. Politically, Max Hakkert was rather secular, liberal and certainly broad-minded. Left: Max Hakkert with a pouting Flip. Right: Max before his music shop (private collection). From 1940 until 1942 Max kept a diary which he rewrote during his exile in France. Through this moving journal we witness the difficult life in wartime Rotterdam, the city he thoroughly loved. On the early morning of May 10th 1940, Max awoke to the sound of air planes roaring in the sky. Germany had attacked the Netherlands without a declaration of war. While he was busy securing his shop, a car from the blood centre came to fetch him so he could donate blood. He left, not knowing that it was the last time he had set foot in his shop. 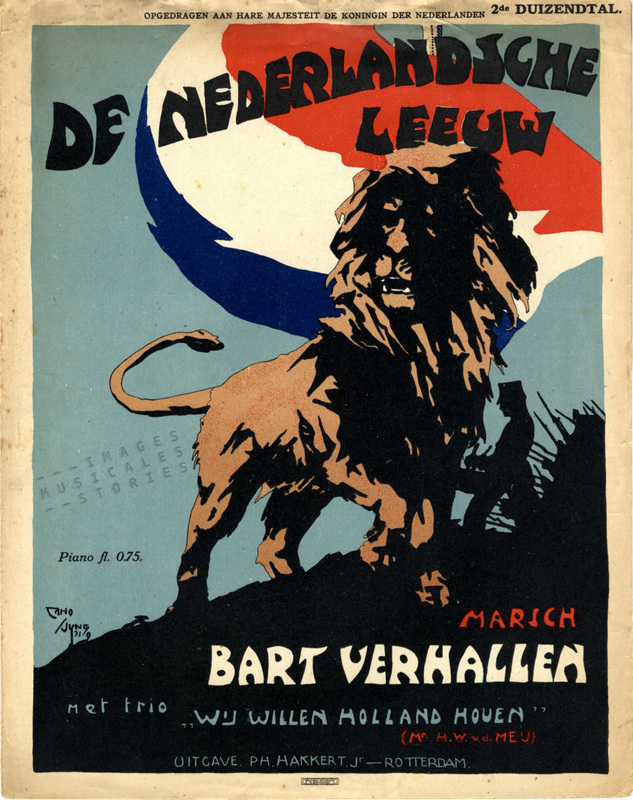 ‘De Nederlandse Leeuw’ by Bart Verhallen, published by Ph. Hakkert (Rotterdam, 1919) and illustrated by Carlo Jung. In the evening Max and his family took refuge in a bank with a large bomb shelter in the basement. The father of the best friend of Flip (Max’s son), was concierge in that bank and he welcomed the family without a second thought. They stayed there during the four days of the Battle of Rotterdam. At some point the family even suggested a possible escape to England. Alas this did not work out. Max heard the ticking and crackling of the fierce battle to conquer the bridges across the river Maas. 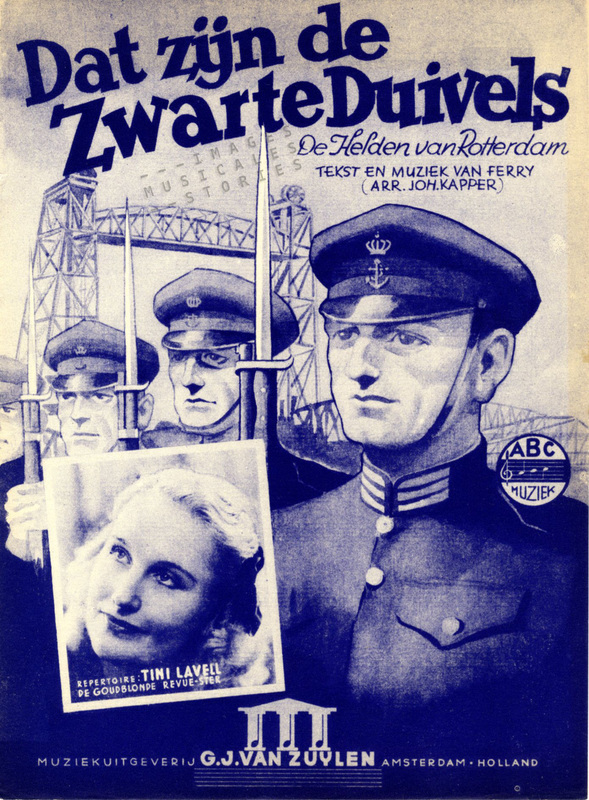 But the efforts of the Dutch Marines, nicknamed De Zwarte Duivels (The Black Devils), to regain control failed. In the sunny afternoon of May 14th, heavy rumbling sounds filled the sky. Max anxiously listened to a sharp whistling followed by a heavy thump. This was repeated again and again. The people in the shelter were in agony. When Max left the shelter two hours later, he saw an apocalyptic cityscape. The entire historic centre of his home town was in flames or destroyed. The places where Max had spent his youth, the cosy streets, the warehouses where he used to smell exotic spices or coffee, the elegant patrician houses, were all gone. The air raid by the Luftwaffe killed hundreds of people and made 85.000 people homeless, including Max and his family whose apartment was destroyed. The music shop also burned down. Apart from some walls nothing was left of it. With great sorrow, Max saw the German soldiers enter Rotterdam. They did not seem tired at all, marching in an endless parade, appearing invincible. Shocked by the Rotterdam Blitz, the Dutch forces capitulated the next day. That day Max and his family left Rotterdam to go living with his mother in Scheveningen. At once Max started to focus on the future. A few days after the bombing he already made plans, together with his staff and his daughter Ans, to rebuild the business in his brother Jacques’ unharmed premises. Although Max lost the largest part of his assets, he reopened his music shop after just six weeks. In August the family moved back to Rotterdam to a makeshift apartment behind the shop. Germans frequently visited his shop to cheer themselves up with music and singing. As Rotterdam kept being sporadically bombed (albeit now by the allies) the family decided to move again, this time to Voorburg, a village near Den Haag where they rented rooms above a hairdresser. Remarkably, in his diary Max never wrote down the word Jew, instead he euphemistically referred to ‘a certain minority’. Also, he only mentioned occasionally and very covertly the anti-Jewish measures which became more and more grim. In October 1940 he had to register his business. In the summer of 1941 Jews were banned from public life. They were prohibited from entering hotels, restaurants, (movie) theatres, public libraries, museums, public swimming pools and parks. Their radios were confiscated. They were even forbidden from owning pigeons. Jewish children would have to attend their own separate schools. Max had to terminate his membership of the Sparta sports club. ‘Sparta-Stadion-Marsch’ by Jac. Blazer, published by Ph. 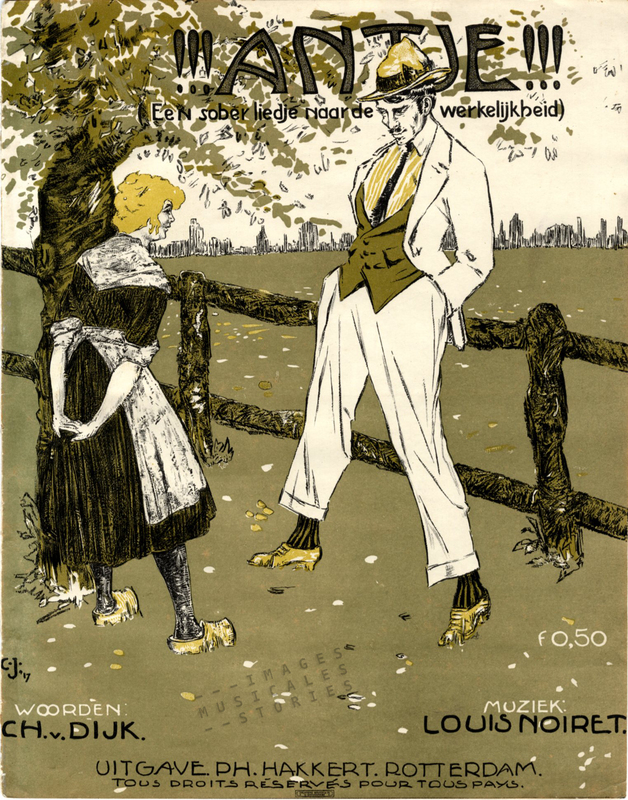 Hakkert (Rotterdam, 1916) and illustrated by D. Coene. The aryanisation of Max’s business began. In December 1941 the authorities forced him to retire from it. Flip, who was needed as a repairman of wind instruments, could continue his work. Max still kept in contact with his business through the manager and his son. 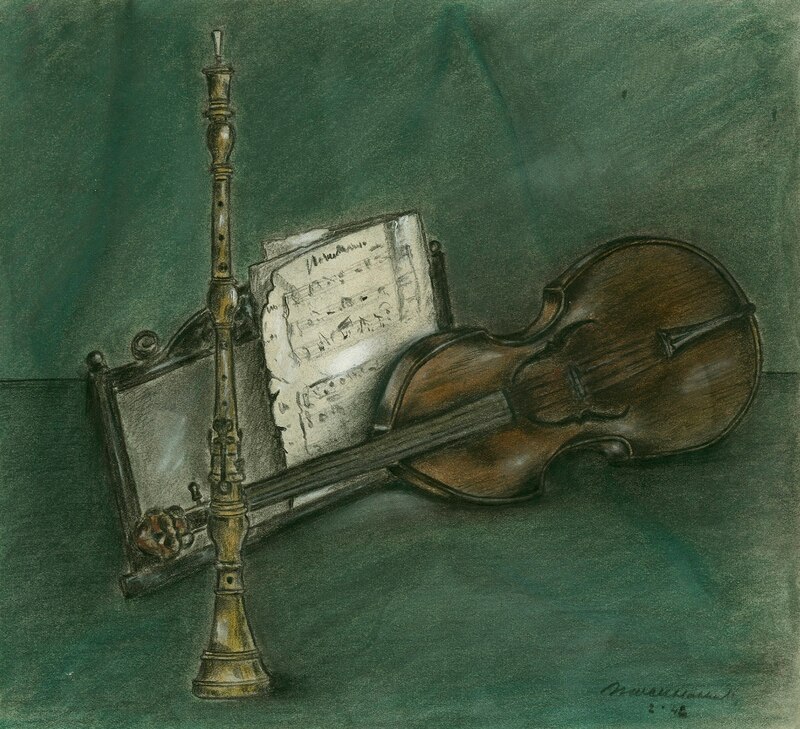 By March 1942 the business was forcefully placed under a German Verwalter (administrator) and Max had lost it for next to nothing… (see our story on Heinrich Strecker vs Franz Sobotka for a similar Nazi persecution of a Jewish music publisher). Max now passed his days in Voorburg by making long walks, playing his cello and drawing or painting. He had studied at an art school and in the early days had drawn at least one sheet-music cover himself. ‘Holland’ by Sim. Velt, published by Ph. Hakkert Jr. (Rotterdam s.d.) and illustrated by Max Hakkert. Max’s son Flip and his intended future son in law, Dries Davids (or Broer as he liked to be called) continued working in the shop. Also being a Jew, Broer had lost his earlier job. The cheerful youngster lived with the family in Voorburg and Max loved him like a son. 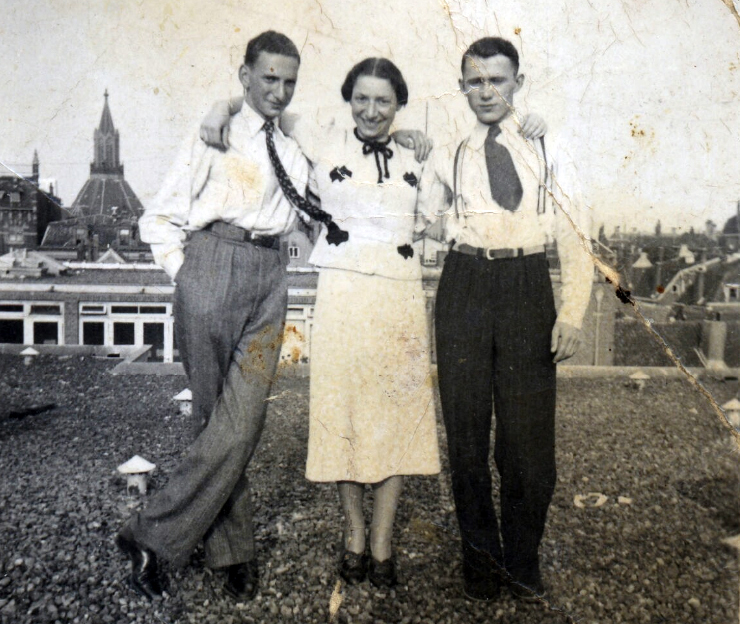 But as Jews were subjected to night curfew and to increasing travel restrictions, Flip and Broer had to stay in Rotterdam for their work from May 1942 on. Nonetheless, the family’s situation must have become untenable and with deportation looming, the family (Max, Flora, Flip, Ans and Broer) decided to flee the Nazi tyranny. In July 1942 the Salvation Army escorted the family to the Dutch border and with the help of passeurs (guides) the family clandestinely crossed the Dutch-Belgian and Belgian-French border. They even succeeded in sneaking over the demarcation line between the Zone occupée in the northern and western part of France and the Zone libre of the Vichy regime in the south. Unfortunately the family was stopped in Lons-le-Saunier, a city in the French Jura.3 They were transported to the Centre d’Hébergement de Rivesaltes in the Eastern Pyrenees, a deceiving name for an internment camp. Construction of Camp de Gurs in 1939 to offer shelter for Spanish refugees. Source: Archives départementales des Pyrénées-Atlantiques, 1 M 182 credit: D.R. At the same time Max, Flip and Broer were officially released from Rivesaltes to be sent to to the Foreign Labour camp (Groupement de Travailleurs Etrangers, or ‘GTE’) of Châteauneuf-les-Bains. This idyllic village in the Puy-de-Dôme was a spa with a lot of empty hotels that were requisitioned to lodge refugees, mostly Dutch. A transfer to a GTE was for the internees like a lifebuoy. They were still under strict control, but they had more freedom than in Rivesaltes. At one point Flip got wounded at the leg and was sent to hospital in Clermont-Ferrand. He had to stay there for almost a month and complained about the very bad food, a daily regime of carrots, turnip and cabbage. 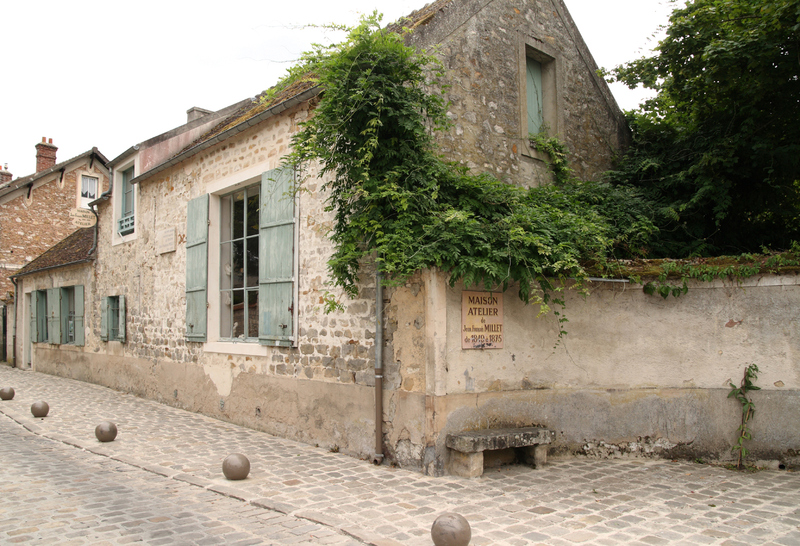 Shortly before Christmas 1942, the family was reunited in Châteauneuf-les-Bains. There they succeeded to rent rooms from two aged ladies so that the five of them could stay together. While thus living in Châteauneuf, the family received help from Alice Ferrières, a French mathematics teacher. 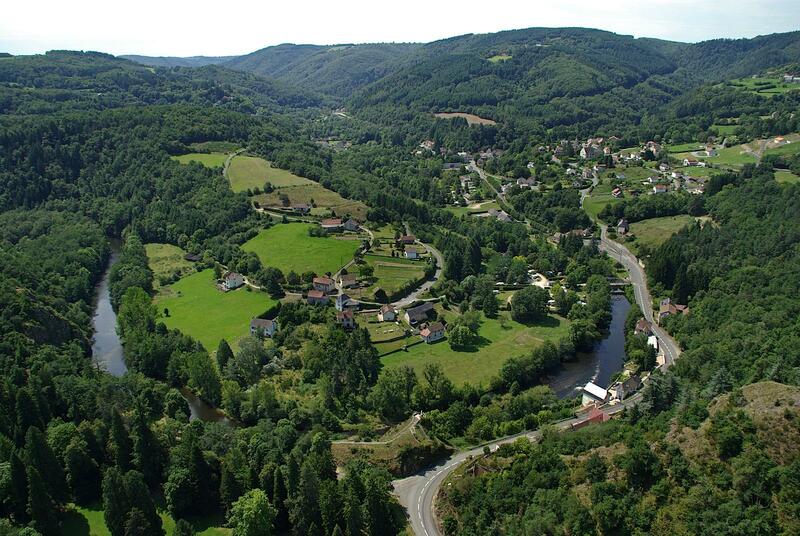 She lived in Murat, a small remote city in the Cantal some 150 km further south. Alice Ferrières was a brave and selfless woman who abhorred the injustice against the Jewish people. From 1941 on Alice had tried to help Jews in any way she could, eventually rescuing around 50 adults and children. She kept full records of her potentially incriminating correspondence and a diary. These have been published in 2010.4 Miraculously, Alice was never arrested. According to a friend of hers, this was because the two local policemen’s daughters were among her pupils. If she had been imprisoned, who would have taught their children? Alice had written to the GTE camp committee at Châteauneuf, offering help for the refugees. And so it happens that the Hakkert family was put in her care. The Hakkerts had suffered malnutrition in the camps, and Alice started to send them food parcels. Max and Broer asked her in a letter for help in finding a job, as they were penniless. They were prepared to accept any work. But then, on the last day of February, disaster stroke again. Max, Flip and Broer were arrested, during the round-up demanded by the Germans in retaliation for a Parisian attack which had claimed the lives of two German officers. This operation aimed at the deportation of 2.000 Jews from former Vichy France. Our three men, together with all the men from the Châteauneuf GTE, were transported to the Camp de Gurs. 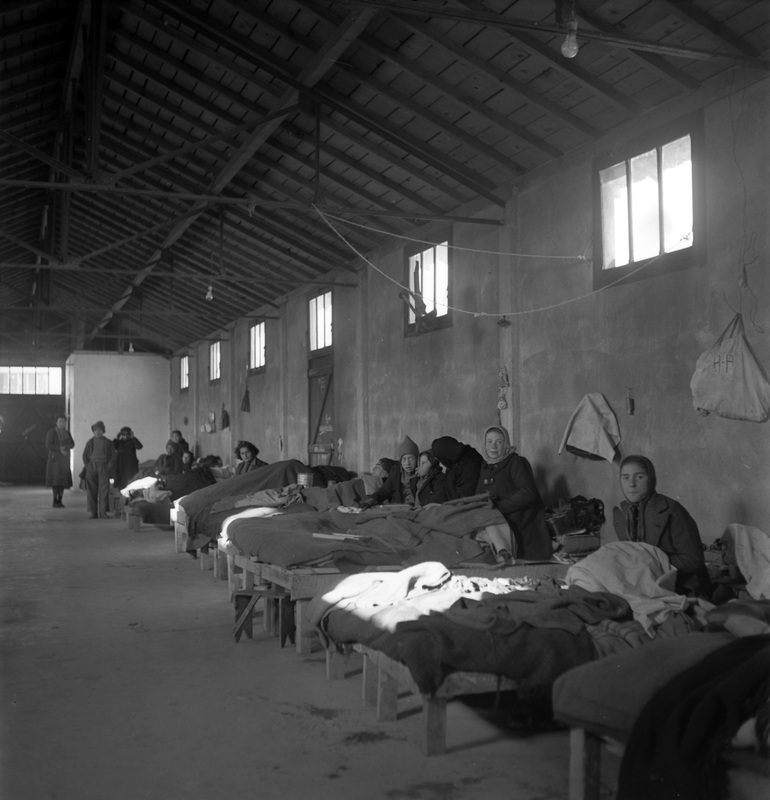 A few days later they were sent overnight to Drancy, the infamous transit camp outside Paris, together with 770 other hébergés (or ‘guests’, a cynical euphemism used by the camp commander). Alice Ferrières’ apartment served as a temporary refuge for several Jews until she could arrange permanent shelter for them in a nearby village. Ans was now terrified of being deported also, and begged Alice for help. She even pointed out how she and her mother could be saved: they needed a document attesting that they had been offered a place in Murat where they could live and work. Alice immediately did the necessary. Ans was offered work as a maidservant by the parents of one of Alice’s pupils and Flora could start to help in a Café. Eight days later, on March 22, they arrived by train in Murat, with their spare possessions folded in blankets. The job for Ans proved steady, but her mother Flora was not so lucky, she had to switch jobs often. According to Alice, Flora seemed lost amidst the mountains, she was highly strung and lived in continuous fear. The two Hakkert women were invited every Sunday afternoon by Alice for le goûter. There they could have a decent meal, meet other refugees, sing, play the piano and find some comfort. At a certain moment Ans realised that the only safe place was across the border in Switzerland. 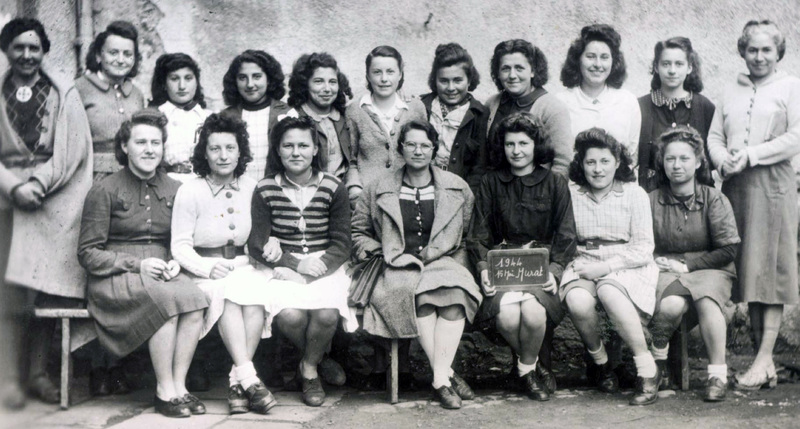 So at the beginning of August 1943 they moved to a ‘secret’ place near Lyon where they were helped by the consul of the Netherlands.6 They had to stay for some months with a family working in the kitchen and making clothes before they were guided to Switzerland where they arrived in January 1944. 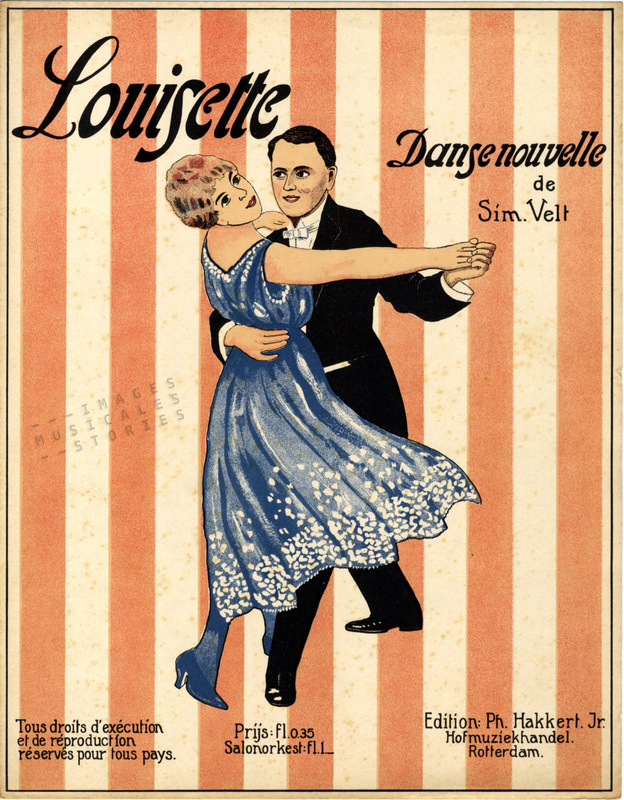 ‘Antje’ by Louis Noiret & Ch. Van Dijk, published by Ph. Hakkert (Rotterdam, 1917) and illustrated by Carlo Jung. I didn’t find out when Ans finally heard about the tragical death of her fiancé Dries, and that of her brother and father. But she must have found some consolation in the company of Adolf Menco whom she met in a Swiss refugee camp.7 They were married in 1945. 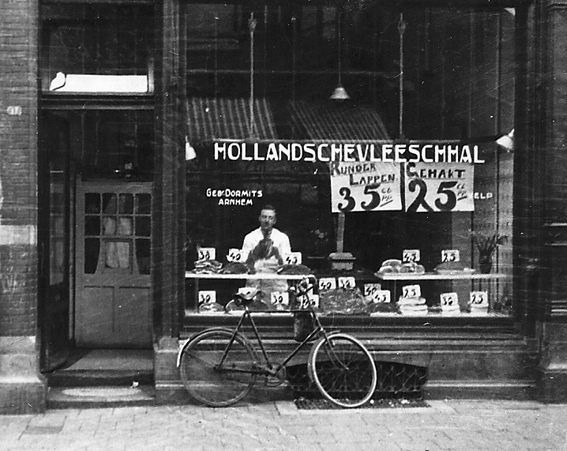 After the war Ans went to live in Arnhem where her husband Adolf returned to start as a butcher again. Ans survived her husband Dolf by almost 30 years and lived to be 93 years old. She hardly ever wanted to discuss the war with her children. 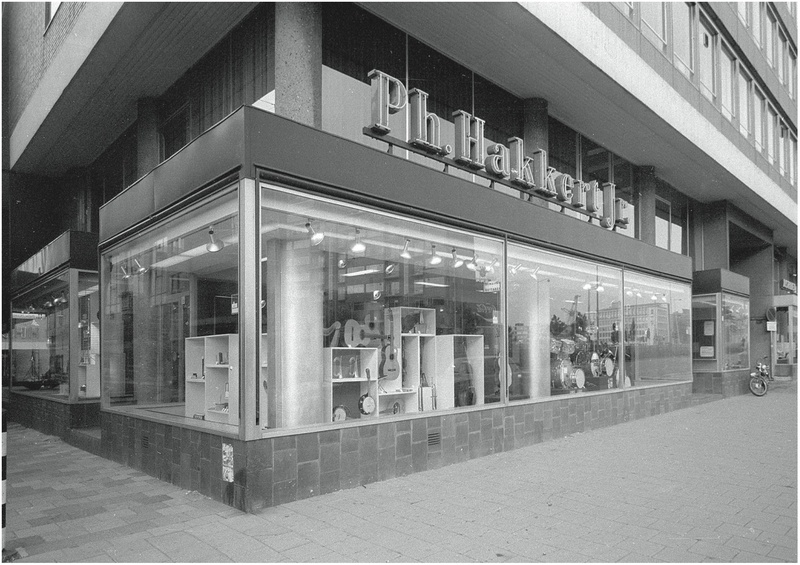 Flora returned to Rotterdam where she rebuilt the Hakkert business, together with her nephew, David (Dé) Sanders. Mostly under David’s guidance it continued to exist until 2007. Flora passed away in 1980, aged 88. Max’s brother Jacques was murdered in Auschwitz in May 1944. 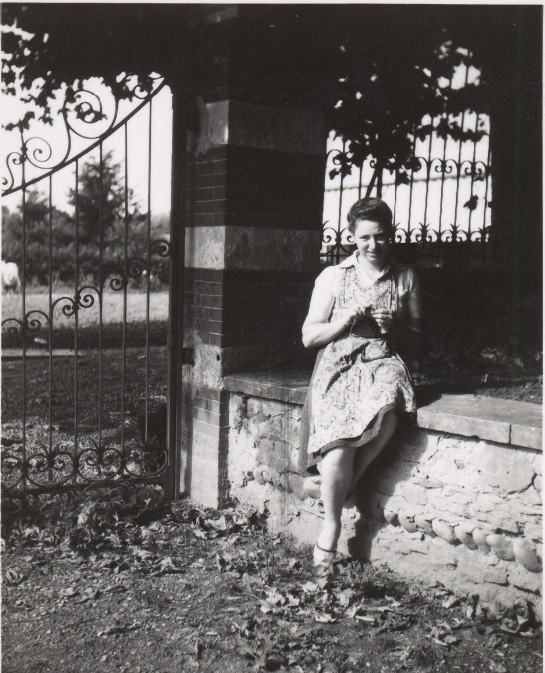 Alice Ferrières visited Ans and Flora in 1947 in Holland. In 1964 Yad Vashem honoured her, as the first French woman, with the title ‘Righteous among the Nations‘. Many thanks to Bert Menco, the son of Ans Hakkert and Dolf Menco for providing us with clues to search in the right direction and for proofreading the draft, to his brother Ido who provided some photographs, to Jos Engels for his article on the Hakkert family in Voorburg, and to Albert Rottier, the last owner of Muziek Hakkert, who compiled an extensive database that helped us in the writing of this article. 1 Officially Philip Hakkert’s name was Hakker. 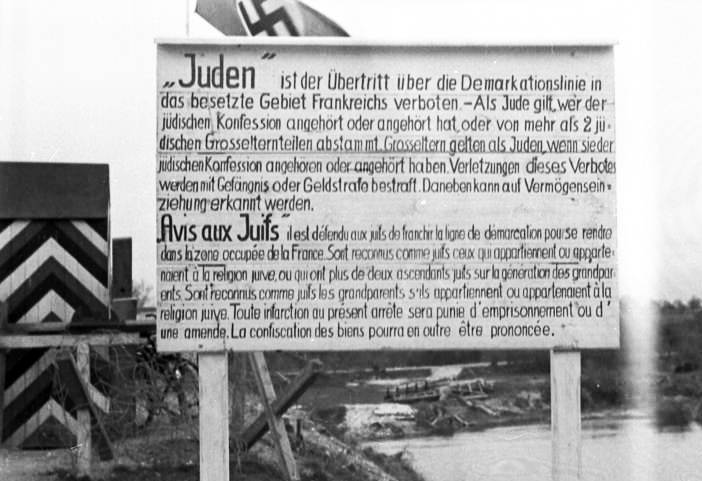 2 “Jews” are prohibited to cross the demarcation line into the occupied part of France. A Jew is a person who belongs or belonged to the Jewish religion, or who descends from more than 2 Jewish grandparents. Grandparents are regarded as Jews, if they belong or have belonged to the Jewish religion. Violations of this prohibition will be punished by imprisonment or a fine. In addition possessions can be confiscated. 3 According to other sources the family would meet a guide In Nancy, France, who would accompany them further. But someone betrayed them. 4 ‘Chère Mademoiselle… Alice Ferrières et les enfants de Murat, 1941-1944’, by Patrick Cabanel (Calmann-Lévy, 2010). 5 There is some confusion about convoy 51 departing from Drancy on March 6, 1943. Historians have long wondered about its exact destination. In any case it was not directed toward the common destination: Auschwitz-Birkenau whose murdering capacities were, at that time, exceeded. According to some, convoy 51’s destination was Majdanek. Other documents state that convoy 51 first arrived in Majdanek but was sent some 100 km further eastward first to Chelm, and then on to Sobibor. Still others claim the train was first sent to Sobibor and then came back to Majdanek with about 50 survivors who had to work there. 6 Probably the Frenchman Maurice Jacquet, a member of the réseau Dutch-Paris in Lyon, an underground network to smuggle people and documents, known In the Netherlands as ‘La Route Suisse’ (The Swiss Way). He was deported to Mauthausen in 1944 but survived. ‘Carnaval de Nice – Op. 54’ by Maurice Decourcelle. Published by P. Decourcelle, Nice, 1894. Cover illustration by A. Douhin. 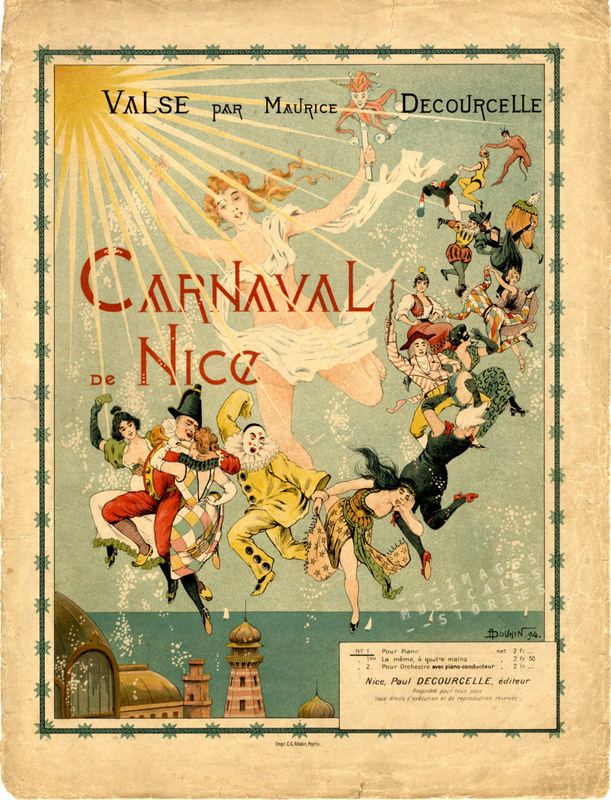 The ‘Carnaval de Nice‘ waltz by Maurice Decourcelle was published posthumously by his son Paul. The radiant cover is from artist André Douhin. The Bibliothèque Nationale de France lists 92 compositions by Maurice Decourcelle (1815-1888), almost all of them published in Paris. His four latest compositions were published in Nice by his son Paul Decourcelle: three of them in 1882, and the ‘Carnaval de Nice‘ above, twelve years later, in 1894. The three earlier publications show definitely less attractive covers by Ernest Buvall. 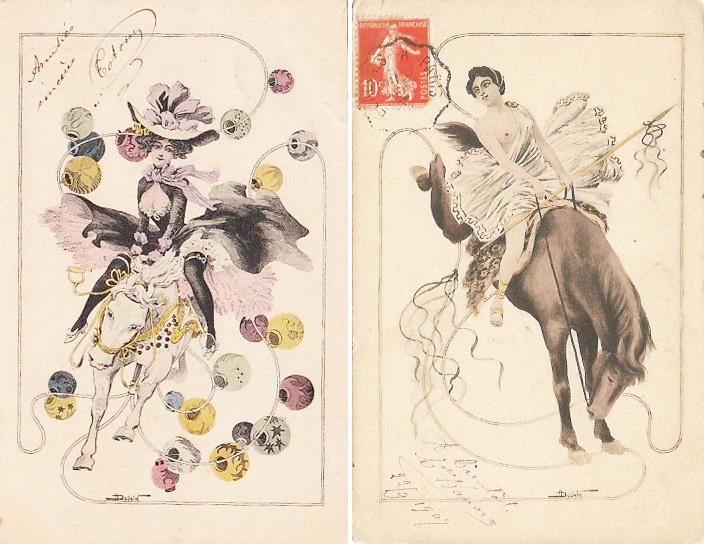 Ernest Buvall was a popular and typical 19th-century illustrator, who created romantic and often dreary covers. 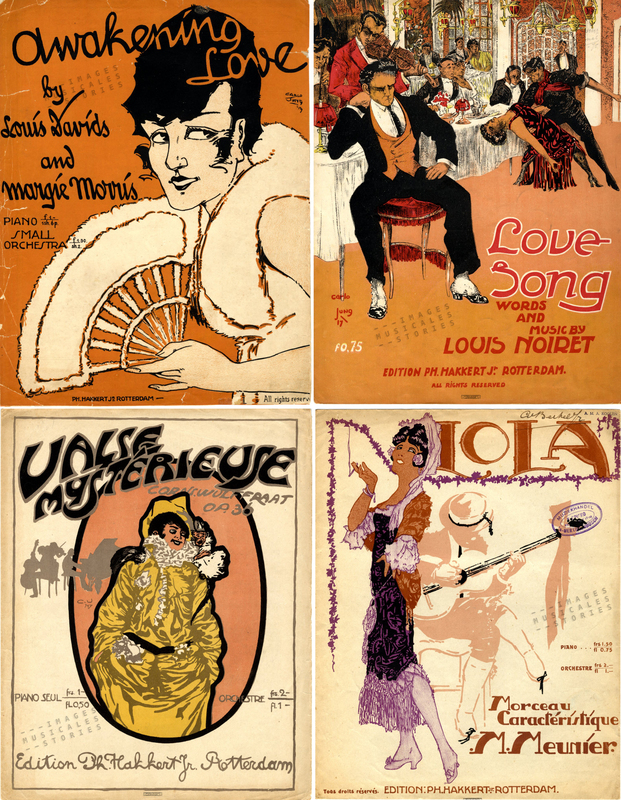 Luckily for all lovers of sheet music, André Douhin took over his work at Decourcelle, well in time to enter the fin de siècle: gaiety, dancing and partying in festive colours! 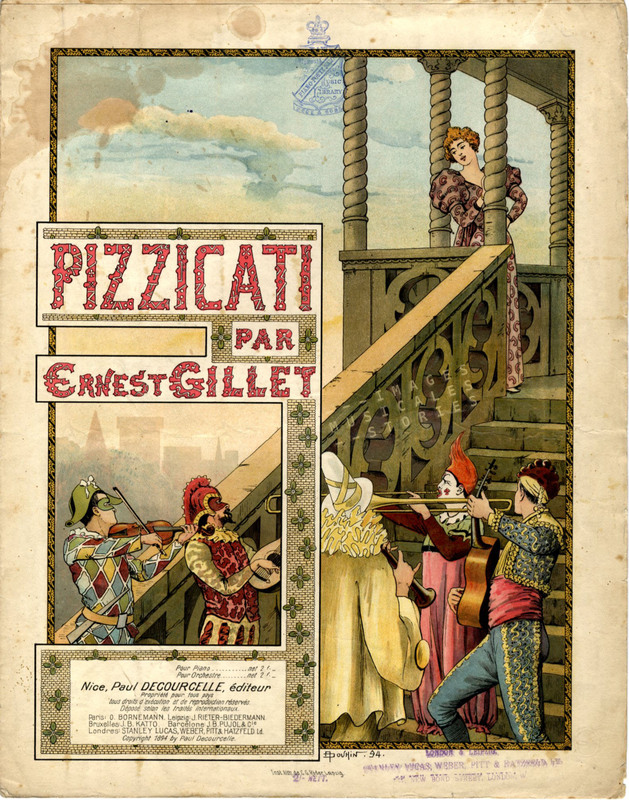 ‘Pizzicati’ by Ernest Gillet, published by Paul Decourcelle (Nice, 1894). Cover drawn by André Douhin. Paul Decourcelle (1854-1940), the son of Maurice, was not only a publisher but also a composer of polkas, marches and waltzes. His creations, under the nickname Heinrich Tellam, were undoubtedly targeted at the mondaine and cosmopolitan public, visiting the casinos and concert halls of the French Riviera. The stylish covers of Douhin, with graphical references to mosaics and stained glass, accentuated that musical chic. ‘On arrive’, a march by Heinrich Tellam (=Paul Decourcelle). Published by P. Decourcelle in Nice (1895) and illustrated by Douhin. ‘Voulez-vous?’ by Heinrich Tellam. 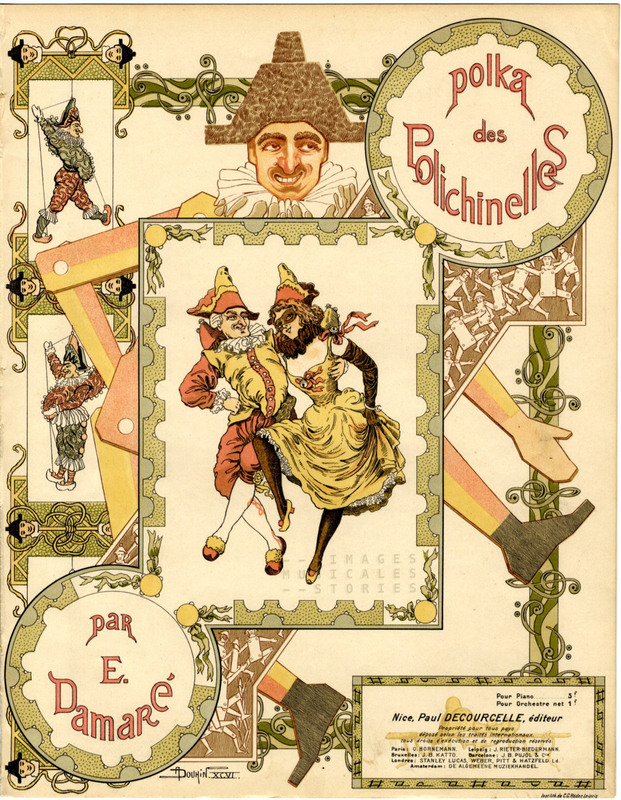 Sheet music composed and published by Paul Decourcelle, in Nice (1895). Cover design by André Douhin. 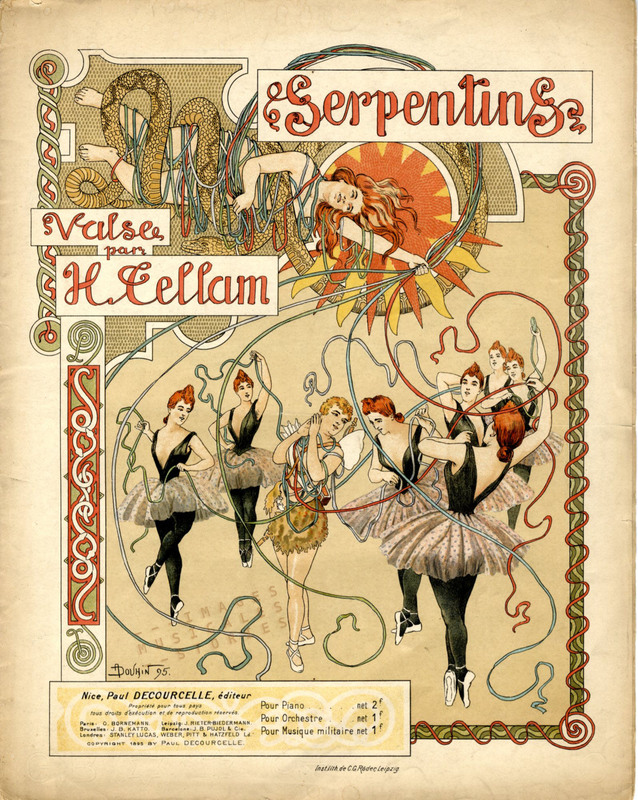 ‘Serpentins’, a walz from Heinrich Tellam (Paul Decourcelle, Nice, 1895). Cover by A. Douhin. ‘MadriPariVienne’ by H. Tellam. Publisher: P. Decourcelle (Nice, 1896). 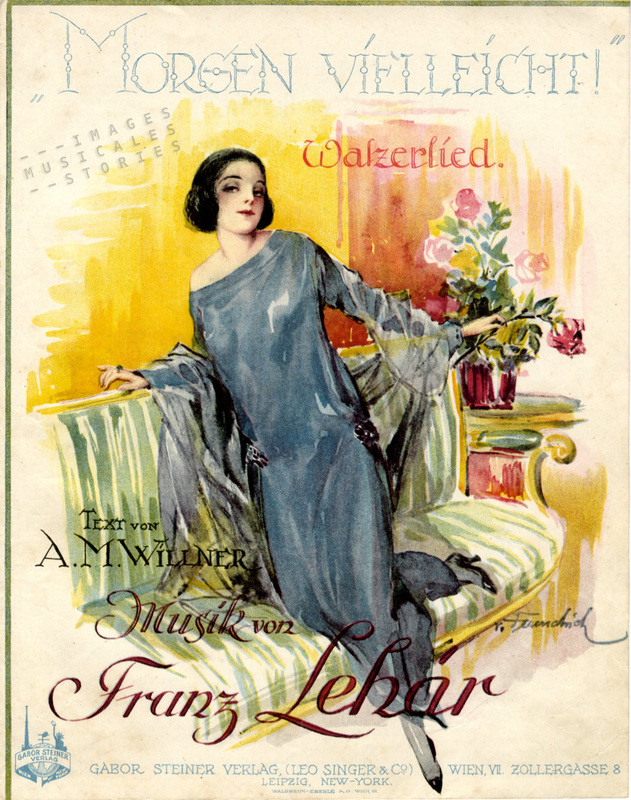 Sheet music cover illustrated by André Douhin. 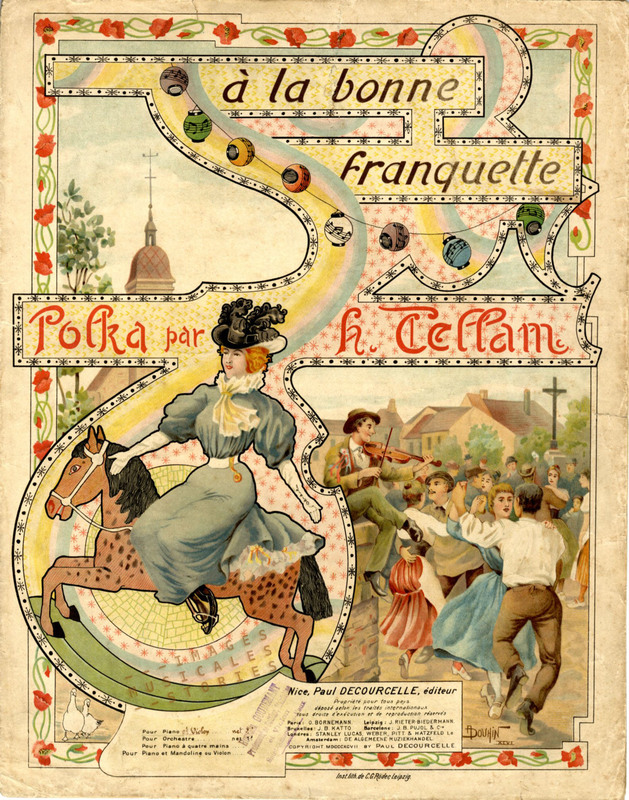 ‘A la bonne franquette’ by H. Tellam. P. Decourcelle publisher, in Nice (1897). André Douhin illustrated the cover. 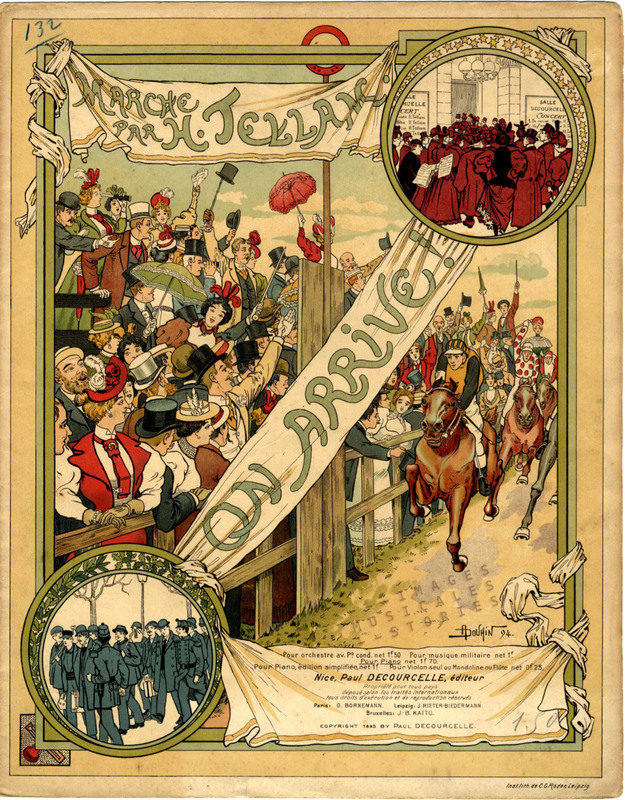 ‘Polka des Polichinelles’, by Eugène Damaré. 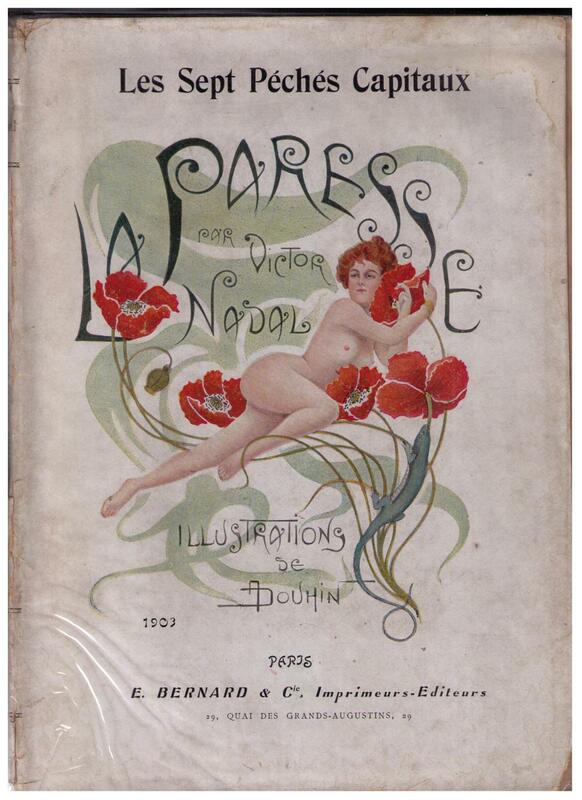 Published by Decourcelle in Nice (1906) and cover illustration by Douhin. Perhaps the initial project about The Seven Deadly Sins was abandoned. In lieu of books, we found on the usual collector markets naughty postcards from around 1903 on the titillating theme, illustrated by André Douhin. 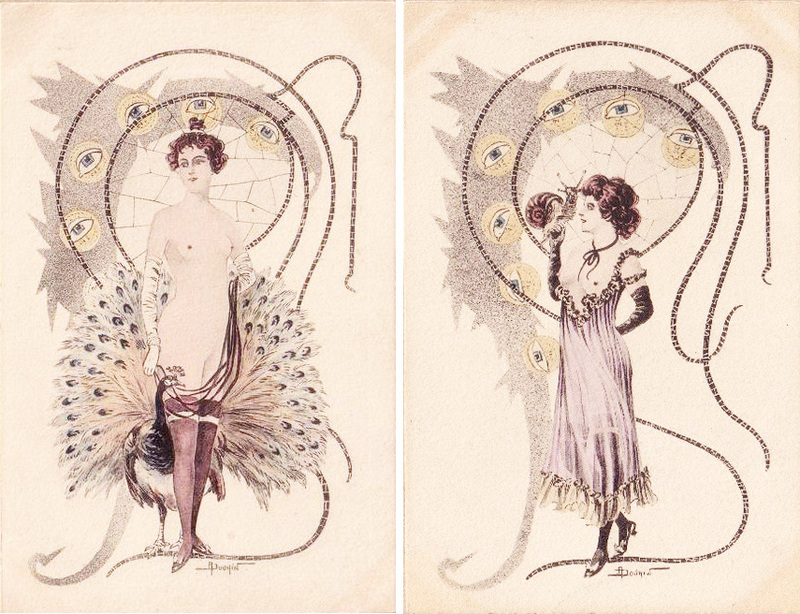 Illustrating bawdy postcards was back then perhaps a lucrative job, because we found other spicy ones illustrated by Douhin. Searching the net for more Douhin postcards, brings the same old, same old. Also the expected few sketches, posters, magazine and book illustrations. 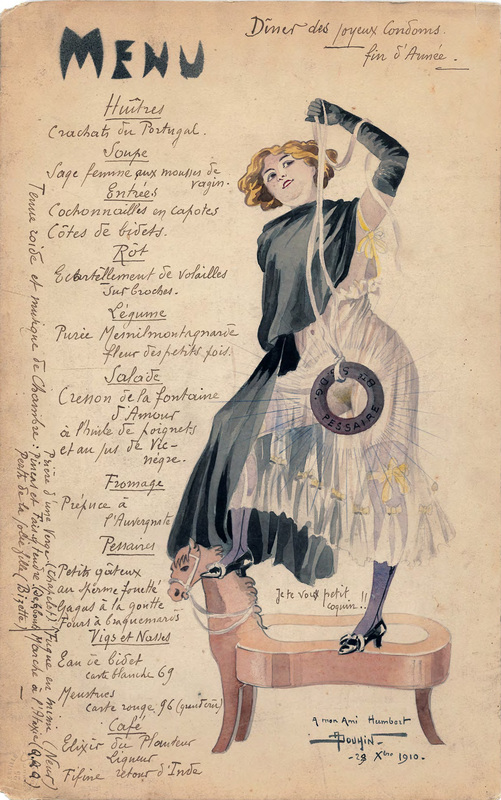 Out of the ordinary is the menu that Douhin drew for his friend Eugène Humbert. Humbert was one of the pioneers of the French neo-Malthusian movement, which in contrast to other countries, evolved in a radical revolutionist direction. Neo-Malthusianism advocates population and/or preventive birth control, promoting contraception. 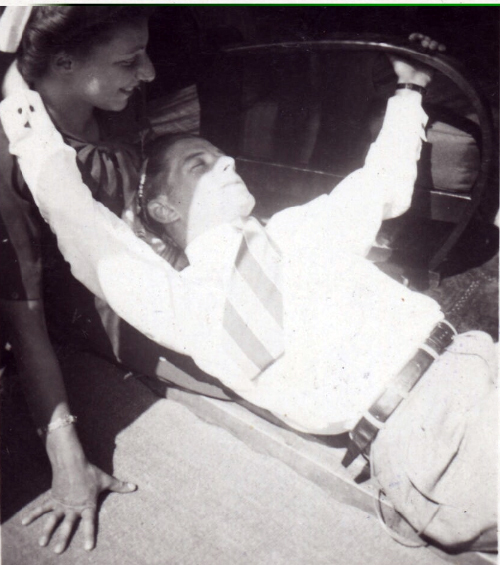 In 1936, André Douhin got killed when his car crashed into a tree between Paris and Rouen (in Vieux-Villez). He was 73 years old. 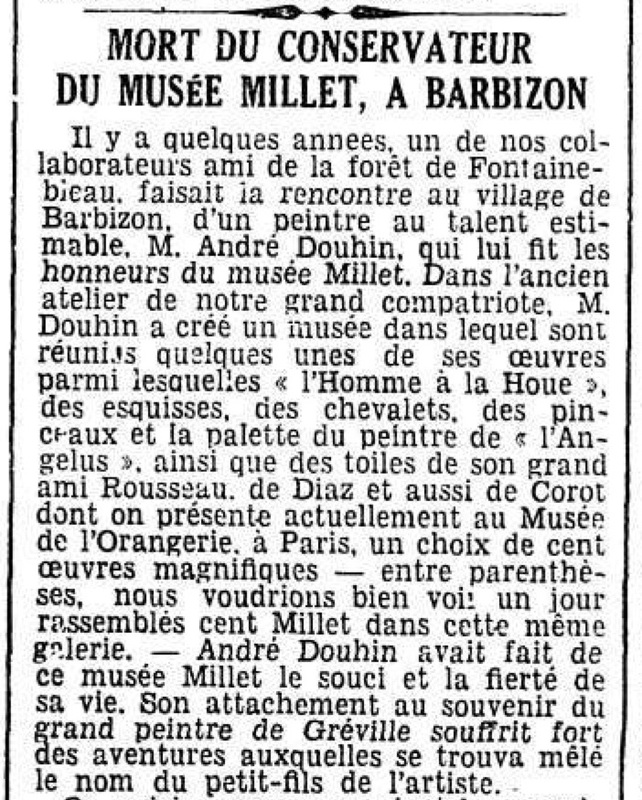 From the newspaper article announcing his death, we learn that Douhin had created a museum devoted to Jean-François Millet, in the master’s old workshop in Barbizon. He worked there as conservator, making it his life’s work to guard the legacy of Millet. 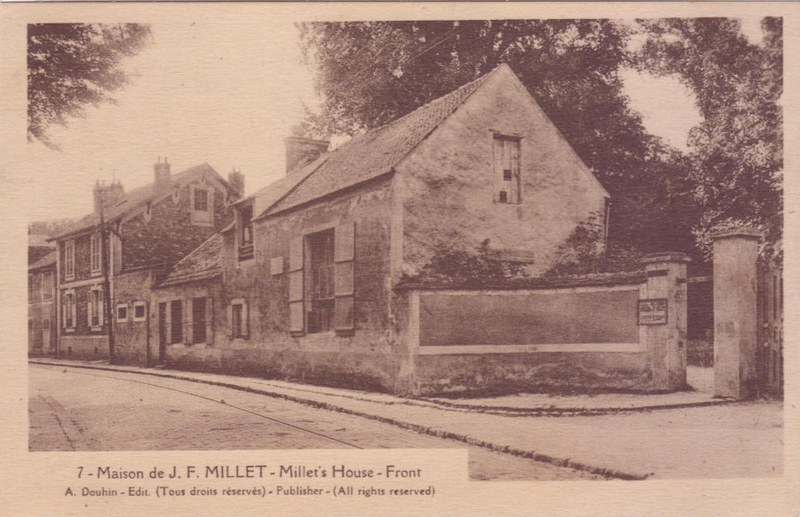 Millet…, yes! The iconic Angelus. One used to sing about everything so why not about the bucolic evening prayer? L’Angélus (1857-1859) by Jean-François Millet, Paris, musée d’Orsay. (source: The Yorck Project). 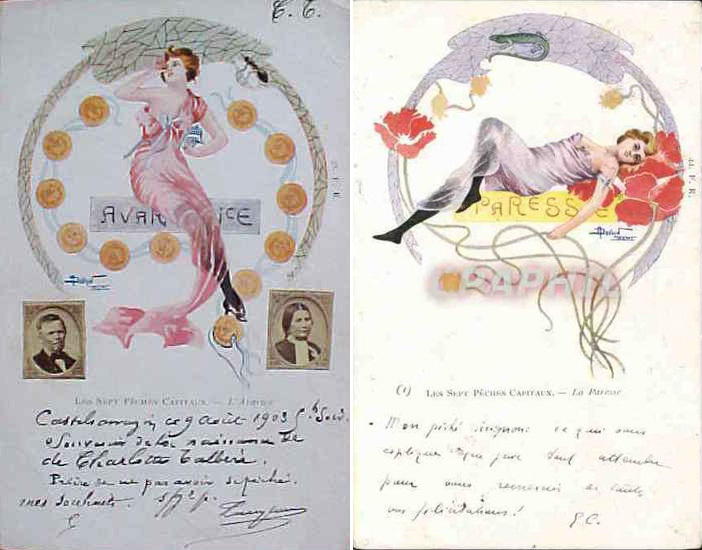 Right: ‘L’Angélus’, song by Gaston Maquis and René Esse, published by Albert Repos (Paris, s.d.). 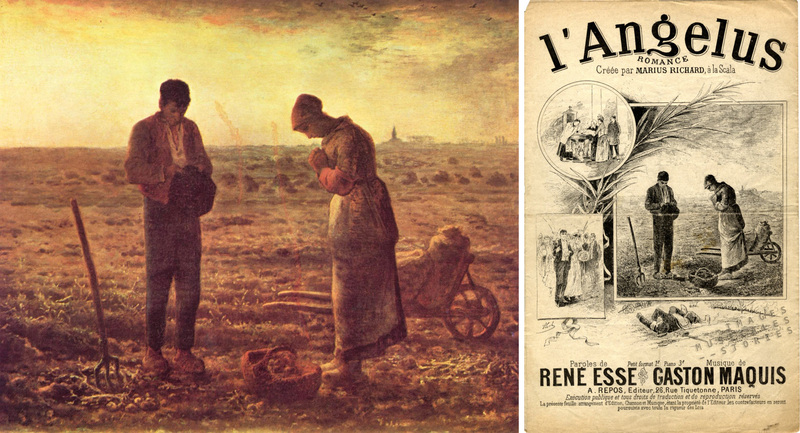 Illustrated by Esch, inspired by Millet. Two more things. 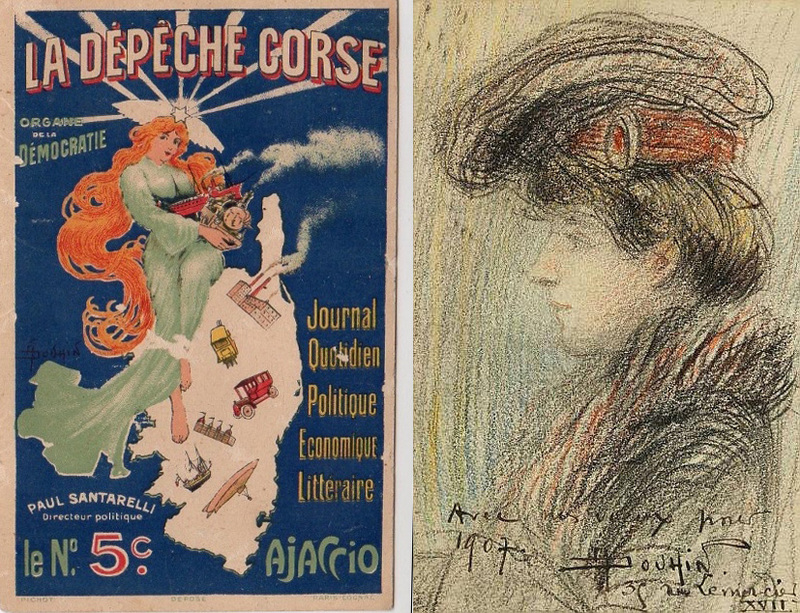 Firstly, we do not know if the cover artist signing as H. Viollet or Viollet-Douhin is related to André Douhin. 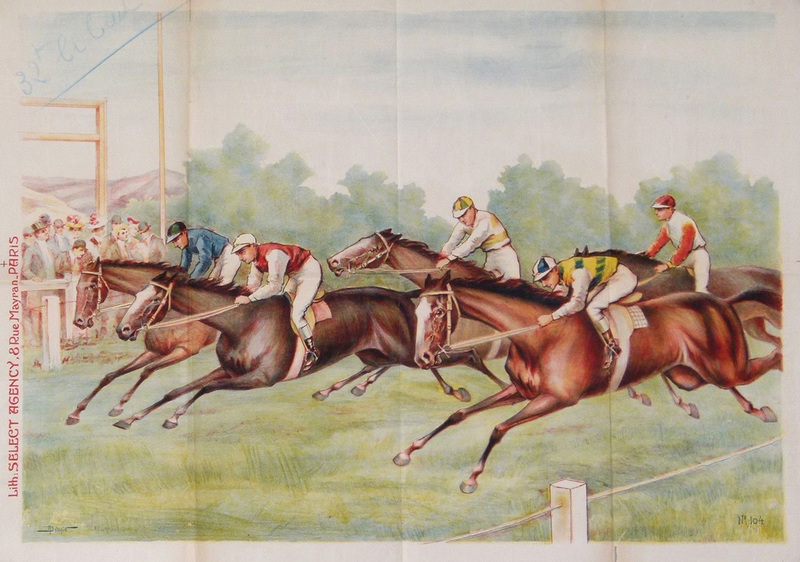 It may be a collective signature for the cooperation between André Douhain and Henry Viollet. Secondly. We don’t know where André Douhin was born, nor where he grew up. But imagining that he was from Nice (which is maybe not so far from the truth) got us a catchy title for this post.